There is just something about this little town that allows people to breathe easier when they are here. Even if it is their first time here, they feel instantly welcomed. They feel like they are home. 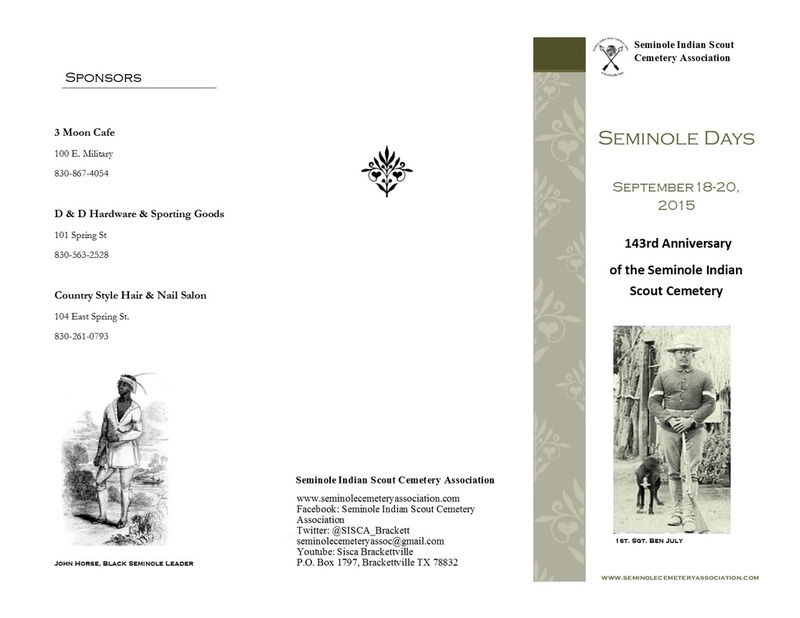 This is what I heard over and over during the Seminole Indian Scout Cemetery Association’s Seminole Days celebration. The celebration began at 7:30 in the morning on Friday, September 18th, when a group of enthusiastic explorers gathered at the Carver School grounds. From there, they journeyed to Seminole Canyon, in Comstock, Texas, where they spent the day exploring, discovering, and communing with the breathtaking surroundings. 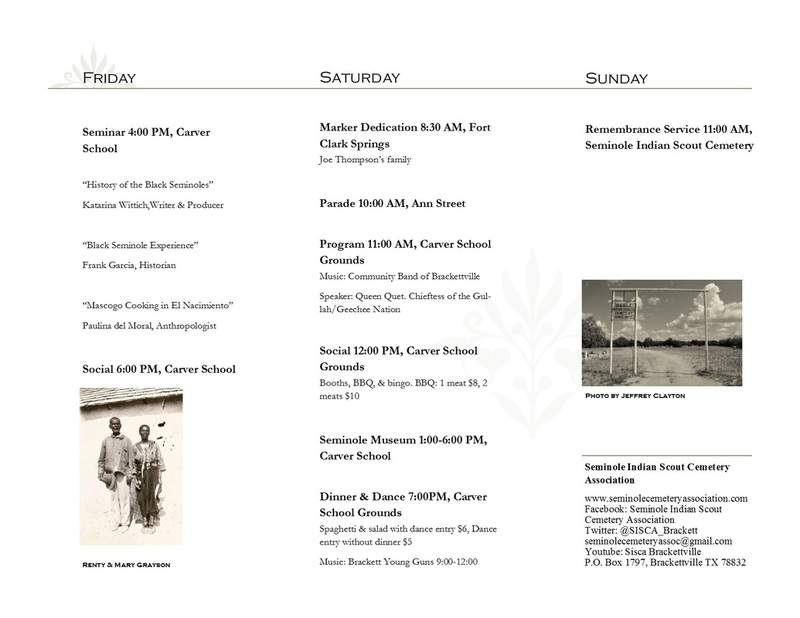 They returned to Brackettville in time to attend the Seminar Series, which began at 4:00 pm at the Carver School. This year, it was important to add new voices to the growing chorus, so Frank Garcia, Kato Wittich, and Paulina del Moral were invited to speak for the first time during this Friday event. Frank Garcia, a youth facilitator from Hondo, Texas, was the first speaker. And that he went first was fitting because he spoke about the origins of the Black Seminoles. Even though this was his first time speaking publically on this subject, Mr. Garcia, a Seminole descendent, has conducted research for more than a decade. The breadth and depth of his knowledge is quite evident, along with his passion and enthusiasm for the subject. Following Mr. Garcia was Kato Wittich, a writer and director from New York City who resides in Los Angeles, California. Kato, who has been researching Black Seminole history for about twenty years, spoke about the history under the history. She implored the group of attendees to understand that their history (both collective and personal) is just as important as the history of their ancestors. She issued a call to action, challenging everyone to begin recording their stories and to begin collecting them, so that future generations will have access to them when they are ready to explore where they came from. Paulina del Moral, an anthropologist from Mexico, was the final speaker. Hailing from Torreón, Mexico, Ms. Del Moral has been studying the Mascogo of El Nacimiento for twenty years. She spoke in detail about the people of El Nacimiento and the food they enjoy. An added highlight was that she brought several pictures that helped to illustrate and give context to her talk. Following the dedication, everyone headed to Ann Street to watch (or ride in) the parade. This year, the parade began on Ann Street and ended at the Carver School grounds. The participants came from all over the United States. They walked and rode in cars, golf carts, or rescue vehicles. A special addition to this year’s parade were the fifty-four signs that were placed on several of the vehicles or held by those who walked. The signs contained the names of the fifty-four scouts who are buried at the cemetery. It was important to find a way to include them since the preservation of their legacy is the reason why we gather each year. Next all the festivities on the school grounds commenced: the BBQ plate sale, the variety of booths, and bingo. These are not only the things that people look forward to every year; it’s pretty safe to say that they are a part of the Seminole Days tradition. In addition, the museum was open from one to six, allowing everyone to take a self-guided tour of the five-month old exhibit. At seven in the evening, the doors to the Carver School opened for a wonderful spaghetti dinner prepared by Chef Victor Sanchez. Also, within the Carver School, a silent auction, which was the brainchild of Marie Young, was held. It became rather tense as the time wound down and several people stayed near to keep an eye on the items that they had selected. Both the spaghetti dinner and silent auction were wonderful additions and huge successes. We look forward to adding them to the itinerary again next year. At nine, the dance started. It was deejayed by two members of the Brackett Young Guns. Brandon and Dillon Blevins did a great job of playin’ the hits and keepin’ the dance floor packed as everyone boogied the night away under the beautiful Brackett sky. The next morning, at eleven, we gathered at the Seminole Indian Scout Cemetery for our final event — the cemetery program. After a welcome from the president, the attendees were asked to come to the microphone to make comments. Many of those who spoke expressed gratitude, love, and reverence for their loved ones buried at the cemetery and pledged to keep their legacies and the place where they are buried in their hearts. Billie Jean Frierson paid respects to those who had passed away in the last year. She was joined by two young children, Billy Barnett and De’rail Wilson, who read Bible scriptures. For all the stress and worry that came with planning Seminole Days 2015, we would happily do it again. Seeing all the happy faces of our longtime and new friends is more than worth it. And everyone can’t wait for next year because they know that coming to Brackettville, Texas means that they are coming home. We would like to thank our sponsors: 3 Moon Café, Country Style Hair and Nail Salon, and D & D Hardware and Sporting Goods for helping to make this year even more spectacular.